The trail connector along Camp Chase between Sullivant Ave and Georgesville Road is finished. This eliminated the one mile roadway along Industrial Mile Rd. The multi use trail along Sullivant Ave and Georgesville Rd has been completed. When heading north along Georgesville Road, the Camp Chase Trail on the Hilltop is just north of the Railway (cross the GAME parking lot to reach the trail). The previous connection is still an option, to travel on Industrial Mile Road between Sullivant Ave and Georgesville Rd. Where the trail meets Georgesville Road, go south (left), cross the Railroad tracks, cross the GAME parking lot, cross (eastbound) Sullivant Ave and follow the multi-use path 1/4 mile to the intersection of Georgesville Road and Sullivant Ave. Continue on the Sullivant Ave path and the Camp Chase Trail will be on the left just before the RRx. Additionally, the new Battelle Darby Creek Metro Park connector in Franklin County is under construction. Metro Parks is extending the Indian Ridge Trail within the park which will replace the segment where bicyclists currently ride on the park road. Knox County will be repaving from Bridge of Dreams to the Holmes County Line. The parking lot area will also be improved to make it ADA compliant handicap vehicle/van accessible. Three new waymarking signs have been added along the HOOT (Heart of Ohio Trail) segment. The City of Columbus opened the new Wilson Road Park trailhead last year along the Camp Chase segment in Franklin County. The trailhead, shown below, includes shelter, drinking water, a tool kiosk, and restrooms. The trail connector along Camp Chase between Sullivant Ave and Georgesville Road is currently under construction and expected to be finished in the next few months. This will eliminate the one mile roadway along Industrial Mile Rd. Additionally, the new Battelle Darby Creek Metro Park connector in Franklin County is expected to be finished by Fall of 2018. Metro Parks will extend and pave the Indian Ridge Trail within the park which replaces the segment where bicyclists currently ride on the park road. Rails to Trails of Wayne County and City of Orrville has received $500,000 of Clean Ohio Trail funding to build a 2.4 mile trail between Orville and Marshallville. OTETF has pledged $15,000 towards this new section which, once connected, will become part of the OTET. Funding is still needed for last 673 yards (at $260 per yard) of the project. Glenmont’s trailhead will be complete with a shelter, picnic tables and restrooms this year. The OTETF board recently approved a new waymarking sign at this location. The Licking County Area Transportation Study (LCATS) has secured funding through a District 17 NRAC (Natural Resources Assistance Council) to make public access improvements, including parking. Village of Galena was awarded $130,000 through a Clean Ohio Trails Fund grant to build a segment of trail on the north side of the village from Miller Park to the Heathermere Subdivision. Great Parks of Hamilton County has received $4.3 million in federal funding through a Congestion Mitigation Air Quality grant to build the bridge that connects the southern terminus of The OTET to Lunken Trail. They will begin construction in 2019 with an anticipated opening in 2021. Preservation Parks of Delaware County will pave the trail section between Cherry and Walnut Streets and the Sandel Legacy Trail in Sunbury. Paving will be completed by fall 2018. Friends of Madison County Parks and Trails will hold a ribbon-cutting ceremony in London on Opening Day of the Trails, April 7 for a recently finished segment of the trail at Maple Street (near SR 665). Cuyahoga County has multiple projects in the works that will take roadway miles off the trail in the downtown Cleveland area. Stay tuned for how these projects will affect the OTET route and its northern terminus location! 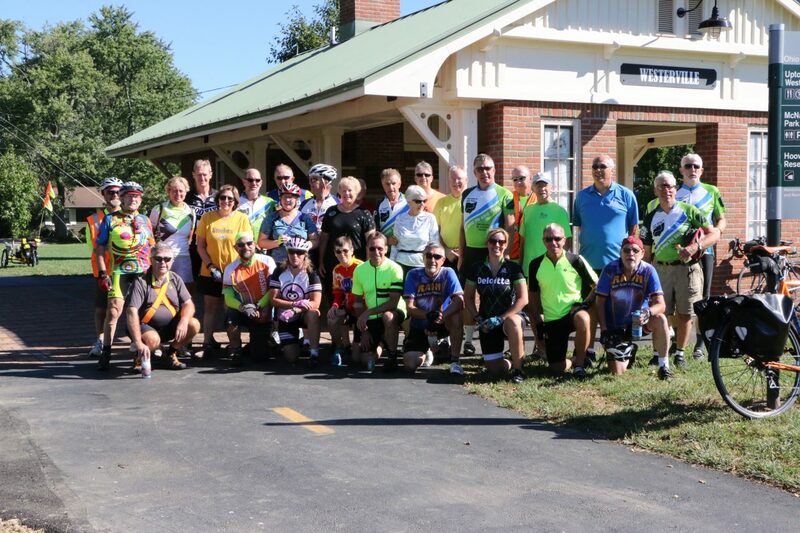 April, 2016 – Columbus Route Change – It is official: the new route through Columbus is open and from the Scioto River Trail, trail users will not go north on the Olentangy Trail where it meets the Scioto River Trail just west of downtown. 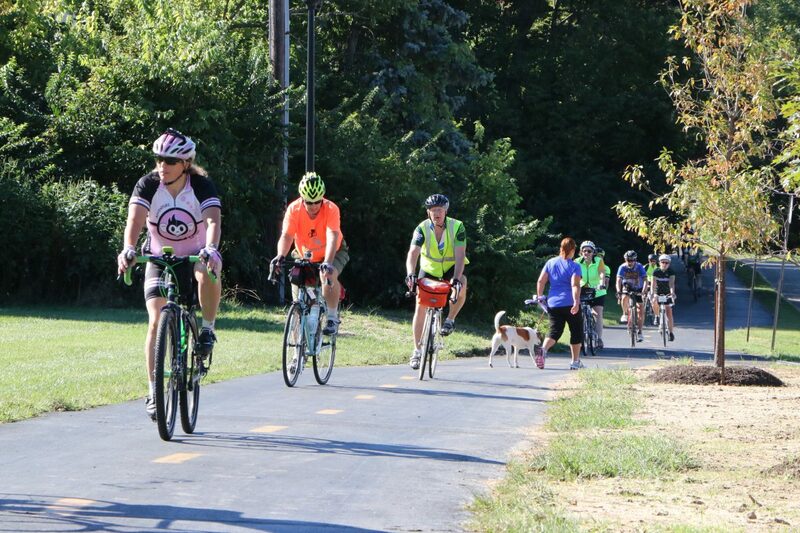 Instead, at the intersection which is now marked with a Route 1 sign, trail users will travel on the connector through Columbus and out east to the new Alum Creek Greenway Trail (ACGT) north to Westerville where it rejoins the current marked OTET route. The new route goes through town passing the convention center and out along I-670 until it comes to the ACGT. Enjoy the beautiful scenery and bridges along the Alum Creek and big thanks to Columbus! March 6, 2016 – Holmes County Trail Extension – in the next couple of weeks trees and brush along the planned 8 mile section of the Holmes County Trail north of Brinkhaven to Glenmont are being removed to make way for the paving of the old rail bed this spring. OTETF Board Member Tom Alexander reports progress is being made daily by many Amish families who are removing the wood. This will extend the OTET from the current Mohican Valley Trail at Route 62 where it goes under the road and will remove the OTET from that busy road to a beautiful country ride via the ole’ train route to Glenmont. From Glenmont, the OTET will then use Route 520 into Killbuck, thus eliminating Route 62. New Route 1 Bike Signs will be placed as soon as the Holmes County Trail is finished to Glenmont. Alexander reports that the right of way into Killbuck from Glenmont has also been secured and in 2017 the Holmes County/OTET will be off streets from Brinkhaven to Millersburg! Great progress in Holmes County for sure. On the OTET Map 2, this is in Panel 1 which will be included in map up-dates when maps are ordered. Thanks to the Holmes County folks. 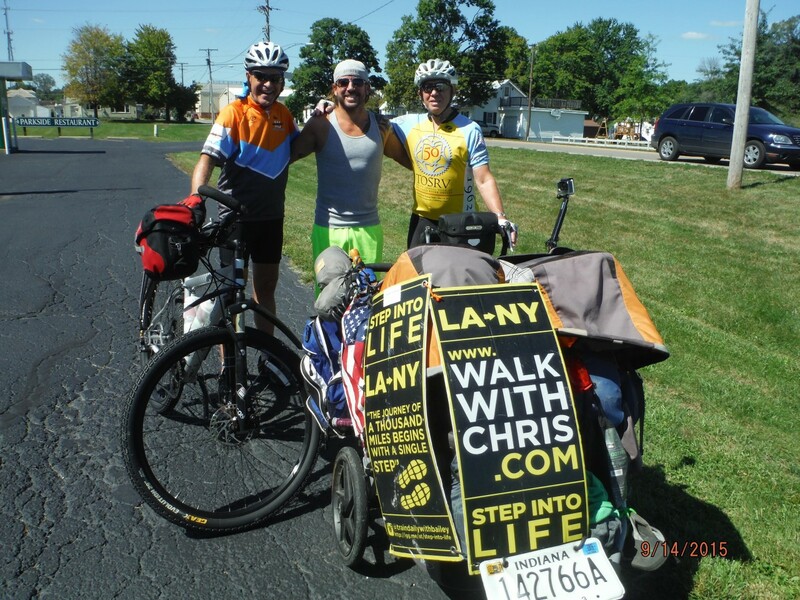 February 2016 – Galena, Ohio – the Ohio to Erie Trail travels currently through streets in this beautiful little village just north of Columbus, but plans are underway to pave a Trail through the town and funds have been secured from a Clean Ohio Grant for Trails and matching local funding! Construction is expected this spring. To support this project, donate through gofundme. February 2016 – Cincinnati, Ohio – the current OTET Route 1 below Milford leaves the Trail surface just west of Avoca Park (Great Parks of Hamilton County) and uses Wooster Pike through the villages of Mariemont and Fairfax, before entering Cincinnati at the Lunken Regional Airport Trail, a distance of about 6 miles. Great Parks of Hamilton County has recently paved about 3 miles along Route 32 on the east side of the Lunken Airport Trail but a bridge is needed to cross the Little Miami River to connect with the Airport Trail’s eastern corner. Once that multi-million dollar bridge is built, the OTET will go off streets for six more miles to Lunken, avoiding the street route of Mariemont and Fairfax. February 2016 – Cincinnati, Ohio – The Cincinnati Council and Mayor, the Hamilton County Commissioners and SOITA have given approval for the OASIS Rail Line from Lunken Airport Trail’s western section to Friendship Park to be used as a rail trail. This approval has not come with any needed funds: estimated to be over 10 million dollars. Once completed this section of the Ohio River Trail/Ohio to Erie Trail will eliminate about another 5 miles of street and mini-trail sections to downtown Cincinnati that are currently used at Bicycle Route 1. February 2016 – Holmes County, Glenmont/Killbuck – From the Bridge of Dreams on the Mohican Valley Trail/Ohio to Erie Trail to Glenmont is a distance of about 8 miles through some of the most beautiful countryside that soon will be paved, reports Tom Alexander, OTETF Board member and Glenmont resident and commissioner. Tom tells us that Route 62 will then no longer be a route used by OTET. In 2016 or 2017, plans also call for the Trail to be paved between Glenmont and Killbuck where the Holmes County Trail starts! February-March 2016 – Little Miami Scenic Trail – Morrow, Ohio – The Little Miami Scenic Trail will be closed for 6 weeks in February and March under the Jeremiah Morrow I-71 Bridge, except for weekends. The closure is necessary as the Dept. of Natural Resources constructs a retaining wall under the bridge to prevent debris from falling on the trail. This is that very high and long bridge on Interstate 71 over the Little Miami River valley below! February 2016 – Little Miami River Scenic – Up-Date at Peters Cartridge Factory at the Kings Mills Trailhead – The trail is generally open near Grandin Road through the end of February. The Trail parking lot at Grandin Rd is also open. Intermittent closures may be necessary for utilities work near the site. Please call the 24/7 hotline for Peters trail closures for updated information: 513-552-7030. Cities and states have long urged their residents to ride bicycles, as a healthy form of recreation and as a green alternative to driving. Now they’re recognizing pedal power’s economic potential. In Ohio there are more and more trails being built with many connecting to the OTET. The link below is to a report from the Pew Charitable Trusts. PEW Charitable Trust is driven by the power of knowledge to solve today’s most challenging problems. PEW applies a rigorous, analytical approach to improve public policy, inform the public and invigorate civic life. Take some time and read the powerful statements from research about the benefits of trails and what many states are doing to develop more and more trails.